Tamiya 32544 German Flakpanzer IV Wirbelwind a 1:48 plastic model kit. 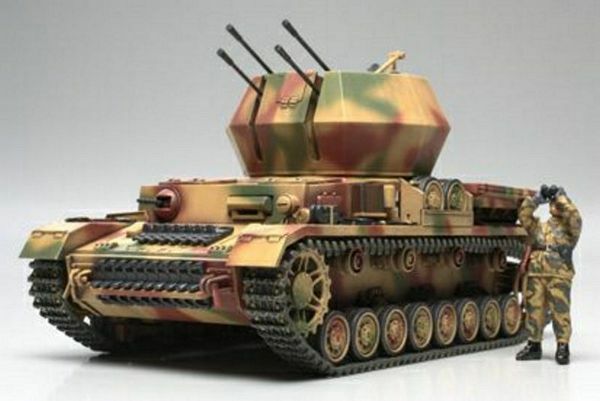 This is Tamiya 32544 German Flakpanzer IV Wirbelwind a 1:48 plastic model kit. One of the main attractions of Tamiya’s 1/48 Military Minature Series is how easily the kits can be integrated into dioramas, especially ones that involve aircraft of the same scale. With the addition of the Flakpanzer IV Wirbelwind, Tamiya gives modelers yet another interesting subject for such projects. As the Luftwaffe lost air superiority, Allied fighter-bombers proved to be an increasingly dangerous threat to the German army, and plans were developed to produce a purpose-built mobile antiaircraft platform to protect the ground units from air attack. The Wirbelwind was based on the proven Pz.kpfw.IV chassis and featured a uniquely-shaped open turret with 9 side panels. Armed with quadruple 20mm Flak 38 L/112.5 fast-firing cannons, it was able to make life difficult for low-flying Allied planes that got in its range as well as provide direct fire support for ground troops. Due to material shortages, production was hampered and there were never enough of these vehicles to go around. High quality 1/48 scale assembly model kit of the Flakpanzer IV Wirbelwind. Distinctively-shaped open turret accurately reproduced with interior details. Quad 20mm guns with gun sight can be elevated to various angles, allowing for more diorama options. Diecast chassis for added weight and realism. Tank treads are assembly type, with the upper section featuring realistic sag effect. 4 figures and two types of markings included.